Porokeratosis is a skin condition involving lesions with thin center surrounded by raised ridges. It may be caused by genetics, UV rays or immunosuppression. Some lesions can develop into malignant carcinomas. Different types of porokeratosis include porokeratosis of Mibelli, linear porokeratosis and disseminated superficial actinic porokeratosis (DSAP). A porokeratosis manifests as a well-defined, slightly raised rim (made up of a cellular protein–keratin). The center may be scaly or thin. They grow gradually to between 3-10 mm, but grouped lesions will appear larger. Porokeratosis of Mibelli is a chronic and slowly progressive skin lesion due to excessive keratinization. The lesion can grow up to 20cm in size into a giant porokeratosis. These lesions may arise in childhood, and have a later onset of sporadic lesions. They are most common on the limbs, especially the limbs, but can affect any body site. DSAP is the most common variety and arises in middle-aged individuals. It presents itself as reddish brown scaly spots. These spots appear on sun-exposed areas of the legs and sometimes on the arms. It may slowly enlarge to form a ring or circle, especially after sun exposure. It can grow up to 10-20mm and may also itch. It is usually seen only in fair skinned people between 30-50, more so in women than men. Most cases are inherited, but some occur in people with weak immune systems. Inherited DSAP may appear in childhood in rare cases. A history of chronic UV exposure appears to the precondition of DSAP. The only way to prevent further sun damage is wearing long sleeves and using strong sunscreens. It may be worth taking Vitamin D supplement tablets, as strictly avoiding sunlight can reduce Vitamin D levels. 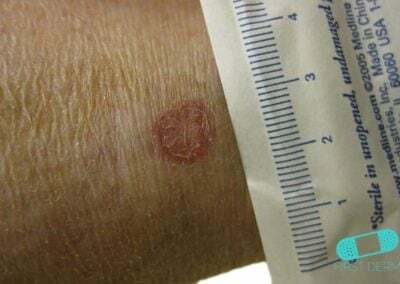 Patients with DSAP appear to have a very low risk of malignant transformation, but most dermatologists advise an exam for skin cancer once or twice a year. Large lesions generally have the highest malignant potential, and malignant change has also been reported in linear forms. In rare cases, porokeratosis of Mibelli can develop into a cancerous lesion, namely squamous cell and basal cell carcinoma. Linear porokeratosis seems to have an increased risk of transformation into squamous cell carcinoma or basal cell carcinoma and may be exacerbated by immunosuppression, UV light, or irradiation. Be sure to report any changes or any new skin lesion that you do not recognize as normal. A biopsy can help diagnose cancerous growth. Topical creams can treat benign porokeratosis, but once malignant, the lesions have to be removed with surgery. Linear porokeratosis is a skin condition that usually shows a poor response to different modalities of treatment. Photodynamic therapy, however, has shown some success in treatment.  There is no known cure for DSAP and porokeratosis of Mibelli, but creams such as topical retinoids, 5-fluorouracil and imiquimod offer some slight help. And cryosurgery is generally useful, but may lead to hyperpigmentation.